A flight cage is an enclosure that allows captive birds to spread their wings without encountering the family cat or wreaking havoc on a home. 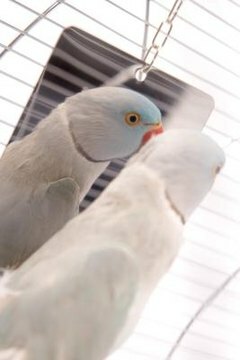 Differing from aviaries, and suitable for table-top use, flight cages for parakeets should be at least 24 inches wide and 36 inches high to allow for horizontal flight. They can be hard on your wallet if you're shopping commercially. It'll make less of a dent to make one yourself. Using wire cutters, carefully cut four wire mesh panels 24 inches wide by 36 inches high. These will become the 4 sides of the flight cage. Cut two panels 24 inches square. These will serve as the top and bottom. With the metal file, sand down any rough edges that could injure your parakeets. Secure the side panels together using J-clips and J-clip pliers. Use a clip every couple of inches to completely secure the cage. Set the cage upright and secure the top using J-clips. Carefully flip the cage upside down to secure the bottom. Cut a 6-inch-by-6-inch square from the front panel of the cage. This will serve as the entryway. To secure the door, attach a row of J-clips with the pliers along the right side where the door attaches. Use the tension spring to secure the door closed.  Adding a second bottom will allow you to slide a tray into the cage to catch bird droppings. ⚠ To protect your hands from sharp edges, wear gloves during assembly.